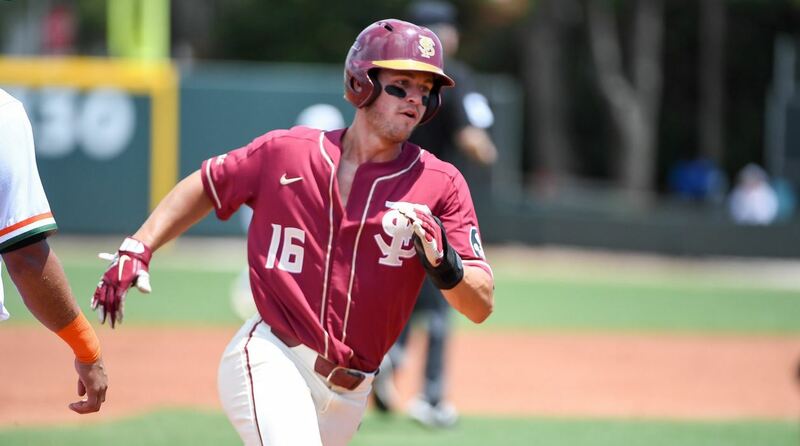 Desperate for a victory, Florida State found a way on Sunday afternoon in Coral Gables, rallying past rival Miami and avoiding the 3-game sweep with a 6-5 win. Miami’s Freddy Zamora had been a hero for the Hurricanes (20-12) for most of the series, but his throwing error in the eighth inning allowed two FSU (19-12) runs to score and break a 4-4 tie. Zamora hit a solo home run in the ninth inning off FSU closer J.C. Flowers, but it was not enough as the Seminoles escaped. FSU broke a streak of 29 scoreless innings in ACC play with a run in the third on an RBI double by Mike Salvatore. That lead would be short-lived as Miami answered with a pair of runs in the bottom half of the inning. Solo shots by Flowers and Johnathan Foster in the top of the fourth put FSU back in front, but the Hurricanes again answered with two runs in the bottom of the inning. Flowers tied the game in the fifth by executing the safety squeeze for an RBI and the contest remained tied until Zamora’s costly error. Conor Grady retired the only batter he faced, but earned his fifth win of the year for FSU. Flowers worked two innings to get the save. Greg Veliz did not allow an earned run, but was the losing pitcher as a result of the error. At the plate, Alec Sanchez got the start in right field for the Seminoles and went 3-for-4 with a run scored. Drew Mendoza and Salvatore each had two hits in the win. Foster scored twice. J.P. Gates was 3-for-4 for Miami with a run scored. Michael Amditis had a 2-run homer for Miami in the loss. Zamora and Jordan Lala each had two hits. Zamora drove in two runs. FSU avoided the season sweep against Miami and will try to do likewise on Tuesday when it hosts rival Florida.